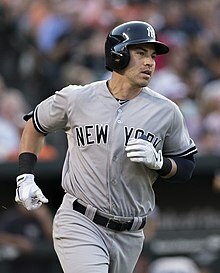 Jacoby McCabe Ellsbury (/dʒəˈkoʊbi/ jə-KOH-bee; born September 11, 1983) is an American professional baseball center fielder for the New York Yankees of Major League Baseball (MLB). He played in MLB for the Boston Red Sox from 2007 through 2013, and joined the Yankees before the 2014 season. Ellsbury was first drafted by the Tampa Bay Devil Rays in the 23rd round of the 2002 MLB draft, but did not sign. He was drafted next as 23rd overall by the Red Sox in the 2005, after playing college baseball for three years at Oregon State University. Ellsbury was the first Red Sox player in history to be a member of the 30–30 club. In 2011, Ellsbury also won the Gold Glove Award, the Silver Slugger Award, and was the American League MVP runner-up to Justin Verlander. After the 2013 season, Ellsbury signed a 7-year, $153 million contract with the Yankees in free agency. Ellsbury is an enrolled member of the Colorado River Indian Tribes; Ellsbury's mother, Margie, is full-blooded Navajo and his father is of English and German descent. Ellsbury is the first Native American of Navajo descent to reach the major leagues. In 2008, he was one of three active non-Hispanic Native American players in Major League Baseball, along with Kyle Lohse and Joba Chamberlain. Ellsbury was born on September 11, 1983, to Jim and Margie Ellsbury, and is the eldest of four children. His mother is a Navajo, a descendant of 19th-century tribal leader Ganado Mucho. Her father Franklin McCabe was a silversmith and her mother a traditional rug weaver. His father, Jim Ellsbury, is of English and German descent. The Ellsburys lived on the Warm Springs Indian Reservation until they moved to Madras, Oregon, when he was in kindergarten. He was raised in the Mormon religion. In Little League, Ellsbury often played with teammates up to three years older than him. At Madras High School, he lettered in five sports. In his senior year in baseball, he hit .537 with 65 stolen bases. In basketball, he averaged 23.6 points and 4.4 blocks per game. He finished his football career with nine interceptions and six kickoff returns for touchdowns. He went to Oregon State University where he was a Baseball America first-team All-American and Pac-10 Conference Co-Player of the year, with Trevor Crowe. He was drafted in the 1st round of the 2005 MLB draft by the Boston Red Sox. Ellsbury began his professional career on July 14, 2005, with the Lowell Spinners in the Class A-Short Season New York–Penn League. On September 7, he tied a Lowell team record with three stolen bases in a single game. Ellsbury finished the season batting .317, with 23 stolen bases in 35 games. Ellsbury began the 2006 season ranked as the sixth-best prospect in the Red Sox' organization according to Baseball America. He started the season with the Wilmington Blue Rocks of the Class A-Advanced Carolina League. On July 3, he tied a Wilmington franchise record by stealing four bases in a game. After batting .299 with 25 steals in 61 games and being named to the 2006 Carolina League All-Star team, Ellsbury was promoted to the Portland Sea Dogs of the Class AA Eastern League on July 12. Soon after his promotion to Portland, Ellsbury was named Eastern League Player of the Week for August 6–13, after batting .400 along with a home run, and hitting safely in seven straight games. Ellsbury finished the season in Portland batting .308 with 16 steals in 50 games and the Red Sox selected him as their Minor League Defensive Player of the Year and Base Runner of the Year. They assigned him to the Peoria Javelinas of the Arizona Fall League (AFL), an off-season developmental league for top prospects. In the AFL, Ellsbury hit .276 in 25 games, and his defensive skills were enough to earn him a spot in the AFL Rising Stars All-Star game. Ellsbury participated in the Red Sox' 2007 spring training camp in Fort Myers, Florida, as a non-roster invitee and was assigned to the minor league camp on March 9. He was rated the best prospect in the Red Sox' organization and the 33rd-best prospect in baseball for 2007 by Baseball America, while Sports Illustrated ranked Ellsbury as the 43rd-best prospect. Ellsbury began the 2007 season as the starting center fielder for the Sea Dogs and was promoted to the Pawtucket Red Sox of the Class AAA International League on May 4 after batting .452 in 17 games at Portland, and being named the Eastern League Player of the Month for April. He was chosen to play in the 2007 All-Star Futures Game as part of the MLB All-Star festivities at AT&T Park in San Francisco. On August 24, Ellsbury set a new consecutive-game hitting streak record for Pawtucket with 25, besting the consecutive-game mark of 19 previously shared by Dave Stapleton and Dave Berg. Ellsbury finished the season with 33 stolen bases for Pawtucket, which tied him for second in the International League with Darnell McDonald of the Rochester Red Wings, and one behind league leader Bernie Castro of the Columbus Clippers. Although Castro had 34 steals in 118 games, and McDonald had 33 steals in 134 games, Ellsbury's 33 steals came in 87 games. For the second consecutive season, the Red Sox selected him as their minor league Defensive Player of the Year and Baserunner of the Year. 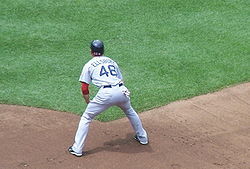 After Coco Crisp was injured, the Red Sox purchased Ellsbury's contract and he received a call-up on June 30, 2007, where he made his MLB debut in center field and hit ninth against the Texas Rangers at Fenway Park wearing number 46. He recorded his first major league hit, an infield single off of Robinson Tejeda, in the bottom of the third inning of that game. His first career stolen base came off pitcher Brandon McCarthy and catcher Gerald Laird of the Rangers on July 2. He also scored from second base in that game on a wild pitch. Johnny Pesky described the play as "the greatest single play I've ever seen in all my years in baseball". He was optioned back to Pawtucket on July 5 after serving in six games for the Red Sox. On August 17, the Red Sox recalled Ellsbury from Pawtucket for the second game of a doubleheader, where he led off and played center field. He was optioned back to Pawtucket after the game. When major league rosters expanded to 40 players on September 1, he was a September call-up by the Red Sox. On September 2, he hit his first major league home run, a solo shot which landed in the Red Sox bullpen, in the bottom of the fourth inning run off Daniel Cabrera of the Baltimore Orioles. A September 2007 article in The New York Times described him as a "cult hero" who brings "speed, improved defense, and unbridled enthusiasm." Ellsbury was named MLB's American League Rookie of the Month for September 2007. With fewer than 130 major league at-bats, he still qualified as a rookie for the 2008 season. During the 2007 postseason, with Crisp struggling, Ellsbury started in center field for Game 6 of the 2007 American League Championship Series (ALCS) against the Cleveland Indians, and started the remainder of the postseason for the Red Sox. In 11 postseason games, he hit .360 in 25 at-bats with two stolen bases. With his two doubles off Josh Fogg in the top of the third inning of Game 3 of the 2007 World Series on October 27, Ellsbury became the first rookie to hit two doubles in the same inning of a World Series game. After hitting another double off Brian Fuentes in the eighth inning, he became the fourth rookie ever to hit three doubles in a World Series game. His four hits, including a single in the first inning, made him only the third rookie to ever accomplish the feat in the World Series, after Freddie Lindstrom in the 1924 World Series and Joe Garagiola in the 1946 World Series. He batted .438 with four doubles and a stolen base for the World Series. The Red Sox eventually won the World Series in a four-game sweep over the Rockies, giving Ellsbury his first career championship title. Heading into the 2008 season, Ellsbury was ranked the 13th-best prospect in baseball by Baseball America, the 16th-best prospect by Baseball Prospectus, and the 19th-best prospect by ESPN Scouts Inc. Ellsbury hit .224, with .291 on-base percentage (OBP), and a .347 slugging percentage in 16 spring training games and started in center field on Opening Day of the 2008 Major League Baseball season against the Oakland Athletics on March 25 at the Tokyo Dome in Tokyo, Japan. Ellsbury had his first career multi-home run game against the Los Angeles Angels of Anaheim on April 22. Ellsbury stole 25 consecutive bases without being caught, until he was caught stealing in a game on May 18. He was two stolen bases shy of the major league record held by Tim Raines in 1979. With three stolen bases against the Baltimore Orioles on May 30, he became the first Red Sox player to steal more than two bases in a game since Jerry Remy stole four in 1980. Ellsbury stole his 32nd base of the season on June 15, breaking the Red Sox' rookie record, set 100 years earlier by Amby McConnell. He finished the season with 50 steals to lead the American League, putting him third on the list of Red Sox all-time stolen base leaders for a single season, behind Tommy Harper (54) in 1973 and Tris Speaker (52) in 1912. Ellsbury finished third in the AL Rookie of the Year voting, behind Evan Longoria of Tampa Bay and Alexei Ramírez of the Chicago White Sox. Ellsbury hit .333, with a .400 OBP and a .567 slugging percentage, and three stolen bases in the 2008 American League Division Series (ALDS), in which the Red Sox defeated the Los Angeles Angels of Anaheim, 3–1, in the best-of-five series. In the second inning of Game 3 of the ALDS, he hit the first three-run single in postseason history when Howie Kendrick and Torii Hunter let a pop-up fall to the ground between them. After going 0–for-14 in the first three games of the 2008 ALCS against the Tampa Bay Rays, Ellsbury was benched in favor of Crisp with only a pinch hitting at-bat in game 4. He did not play in the final three games of the series, and the Sox eventually lost the series 4–3. Ellsbury played his 179th straight regular-season game without an error on April 12, 2009, breaking the franchise record for outfielders held by Mike Greenwell. On April 15, with six errorless chances, Ellsbury passed Coco Crisp for most errorless total chances by a center fielder, setting a new Red Sox franchise record of 433. Ellsbury tied a major league record for outfielders with 12 putouts in a nine-inning game on May 20, tying Earl Clark of the Boston Braves, who accomplished the feat in 1929, and Lyman Bostock of the Minnesota Twins, who did it in 1977. Ellsbury's streak of errorless games ended at 232, with 554 errorless chances, when he committed an error on June 17. Ellsbury tied Tommy Harper's franchise single season record for stolen bases (54) on August 21. Ellsbury then broke the record with his 55th steal on August 25, against the Chicago White Sox. He finished the season with 70 stolen bases, the most in the American League, and he also led the league in triples with 10. He won Defensive Player of the Year in MLB.com's annual This Year in Baseball Awards 2009. During the offseason, Ellsbury changed his uniform number from 46 to 2, which had belonged to the Red Sox' former bench coach, Brad Mills, who left the organization to become the manager of the Houston Astros. With the Red Sox signing free agent center fielder Mike Cameron and not re-signing left fielder Jason Bay, Ellsbury became the Red Sox' starting left fielder. The move was made as the result of Cameron's experience in center and inexperience in left. Manager Terry Francona expressed excitement over the prospect of playing a true center fielder in left field, creating a larger fielding range and more aggressive style. On April 11, Ellsbury collided with Red Sox third baseman Adrián Beltré in a game against the Kansas City Royals, and the collision resulted in hairline fractures to four of his left ribs. He was put on the 15-day disabled list on April 20, and he returned to the Red Sox on May 22. He returned to the 15-day DL on May 28 after playing in only three games due to residual soreness in his ribs from the collision with Beltré. He met with a thoracic specialist who advised him that his ribs should be further along in the healing process before he would be able to play. He started a rehab assignment with Lowell on July 26, and rejoined the Red Sox on August 4. Ellsbury returned to the 15-day disabled list on August 14 after re-injuring his ribs in a game against the Texas Rangers. He did not play again in 2010. During games on August 2 and 3, Ellsbury had walk-off hits in the back-to-back games against the Cleveland Indians; a single off Vinnie Pestano and a home run off Joe Smith. On August 6, he hit a three-run home run and drove in a career-high six runs in Boston's 10–4 win over the New York Yankees. On September 25, he hit two home runs during the first game of a doubleheader against the Yankees to become the first member of the Boston Red Sox to join the 30–30 club. Ellsbury joined the 30–30 club in 2011. Ellsbury finished the season with career highs in home runs (32), hits (212), RBIs (105), runs (119), and batting average (.321). He also led the American League in power-speed number (35.2). He won his first Gold Glove Award, and finished as one of only two qualifying players to complete the season with a 1.000 fielding percentage. Jacoby was awarded a Silver Slugger Award for his hitting, joining teammate Adrian Gonzalez as the only American League players to win both the Gold Glove and Silver Slugger Awards in 2011. Ellsbury was voted the American League Comeback Player of the Year, and finished second in the 2011 American League Most Valuable Player Award balloting, with 242 points, losing to Justin Verlander (280). On April 13, 2012, while attempting to slide under Tampa Bay Rays shortstop Reid Brignac in an attempt to break up a double play, Ellsbury collided with the shortstop. His right shoulder was injured when Brignac fell on top of his exposed shoulder. He was placed on the disabled list with a subluxation of the shoulder on April 14. He was activated from the DL and returned to the Red Sox lineup on July 13, and finished the season with a .271 batting average, four home runs, 26 RBI, and 14 stolen bases in only 74 games played. Ellsbury set a franchise record for most stolen bases in a game with five on May 30. In the August 28 game against the Orioles, Ellsbury suffered a compression fracture by fouling a ball off his right foot. He was taken to the Steadman Clinic in Vail, Colo., for treatment from Dr. Thomas Clanton, who cleared him to rejoin the Red Sox lineup on September 25, well ahead of the preliminary prognosis. Ellsbury turned in a strong performance in the 2013 postseason, batting .500 in the 2013 ALDS and .318 in the 2013 ALCS. In the 2013 World Series, Ellsbury started the eventual series-winning rally in Game 6 with a single and earned his second World Series ring as a member of the Red Sox. Ellsbury's contract expired on October 31, 2013, and he became a free agent for the first time in his career. On December 3, 2013, Ellsbury and the New York Yankees agreed in principle to a seven-year, $153 million deal, including an option for an eighth year that could increase the value of the contract to $169 million. The contract became official on December 7. On April 23, 2014, Ellsbury played his first game at Fenway Park since leaving the Boston Red Sox to join the New York Yankees. He received an ovation of boos from Red Sox fans. In his first season with the Yankees, Ellsbury hit .271 with 16 home runs and 39 stolen bases. He remained healthy for most of the season, playing in 149 games, the third-most games he has ever played in one season. Ellsbury's home run count was the second-highest of his career next to his 2011 season. He also led the American League in power-speed number (22.7). Ellsbury had a hot start to 2015, batting .363 up to May 7. On May 20, 2015, Ellsbury was placed on the 15-day disabled list due to a right knee sprain. Prior to the injury, he compiled a .324 batting average in 148 at-bats. After missing nearly two months, Ellsbury returned on July 8, 2015 and had an extremely rough end to the season. He batted .224 in 74 games after he returned from the disabled list and did not start in the 2015 American League Wild Card Game, losing his job in favor of Chris Young. He ended the underwhelming season hitting .257/.318/.345 with 7 home runs and 21 stolen bases in 111 games. On April 22, 2016, Ellsbury executed a straight steal of home against Matt Moore of the Tampa Bay Rays during a full count, tying the game at 3. It marked the first time a Yankee successfully stole home since Chris Young did so in 2014 as part of a double steal, and the first straight steal of home since Derek Jeter in 2001. It was Ellsbury's second career steal of home; the first occurred in 2009 against Andy Pettitte and the Yankees. On June 8, Ellsbury hit the highest home run of the MLB season against the Los Angeles Angels, reaching a recorded 151 feet in the air. On July 20, Ellsbury reached base via catcher's interference for the ninth time in the season, setting a new single-season MLB record. The record had previously belonged to Roberto Kelly, who reached base eight times on catcher's interference in 1992. Ellsbury would end the season with 12 catcher's interferences. Ellsbury played in 148 games in 2016. While he remained fully healthy, the 2016 season was another underwhelming one for Ellsbury offensively, as he hit .263/.330/.374 with 9 home runs and 20 stolen bases, the latter being his lowest in a healthy season. On April 28, 2017, Ellsbury hit his first career grand slam against the Baltimore Orioles in a 14-11 Yankees comeback win. It was also the 100th home run of his career. On May 24, Ellsbury made a superb catch at the center field wall, but also banged his head at the wall, causing him to suffer a concussion. He was placed on the 7-day disabled list the next day. On June 10, Joe Girardi stated that Ellsbury had lost his job as the Yankees' starting center fielder to Aaron Hicks, who would continue to start even when Ellsbury is healthy. Ellsbury was activated from the disabled list on June 26 after missing 29 games, the same day that Hicks was placed on the 10-day disabled list with an oblique injury. With the rise of rookie outfielder Clint Frazier, Ellsbury lost his job again and was relegated to the bench. 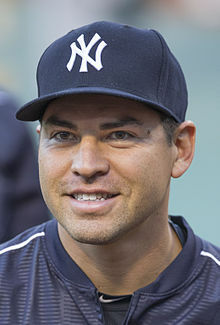 On his 34th birthday on September 11, Ellsbury reached via catcher's interference for the 30th time in his career, which broke Pete Rose's career record of 29. In 2017 he batted .264/.348/.402 with 7 home runs and 22 stolen bases. On March 19, 2018, the Yankees announced that Ellsbury would not be ready for Opening Day as he was diagnosed with a right oblique strain since the beginning of spring training. On April 3, it was subsequently revealed that Ellsbury was diagnosed with a hip ailment, putting him out for a longer period of time. On August 6, he had surgery to repair a torn labrum in his left hip, causing him to miss the 2018 season without having played a single game. Ellsbury began the 2019 year on the 10-day injured list due to a foot injury. On April 20, he was transferred to the 60-day injured list. Ellsbury was raised as a member of The Church of Jesus Christ of Latter-day Saints (Mormon), but he and his three brothers stopped attending services when Jacoby was a teenager; as reported in The Boston Globe in 2008, Ellsbury said, "I try not to get [God] too involved in baseball. What I wish for is good health." Ellsbury was one of the victims of the $8 billion fraud perpetrated by wealth manager Allen Stanford; although he had some assets frozen, it did not cause him any significant hardship, like those suffered by Johnny Damon and Xavier Nady. Ellsbury married Kelsey Hawkins in December 2012. They have two children together. In 2010, Ellsbury released a Zinfandel wine called ZinfandEllsbury through Charity Wines, with 100% of his proceeds donated among three charities: The Navajo Relief Fund, Project Bread: The Walk for Hunger, and Ellsbury Read Project. The wine launched alongside a charity wine by former Boston Red Sox teammate Josh Beckett, called Chardon-K.
^ "2011 Awards Voting". www.baseball-reference.com. Baseball-Reference.com. Retrieved August 25, 2014. ^ Edes, Gordon (March 11, 2007). "Ellsbury a rare talent". Boston Globe. Retrieved March 11, 2007. ^ a b "JockBio: Jacoby Ellsbury Biography". jockbio.com. Retrieved April 14, 2015. ^ Foster, Oree. "Indian Country Proud of Red Sox's Ellsbury". gallupindependent.com. Archived from the original on December 1, 2007. Retrieved December 4, 2013. ^ a b McPhillips, Alex. "Ellsbury shows his speed in debut". mlb.com. Retrieved July 1, 2007. ^ Mallozzi, Vincent M. (June 8, 2008). "The American Indians of America's Pastime". The New York Times. ^ a b "Ellsbury Making History". Oregon State University Official Athletic Site. October 20, 2007. Archived from the original on December 22, 2015. Retrieved December 21, 2015. ^ a b Rieber, Anthony (December 4, 2013). "Jacoby Ellsbury is a fierce competitor and center of attention on field". Newsdasy. Retrieved February 18, 2014. ^ "Chegg.com". www.chegg.com. Archived from the original on September 24, 2016. Retrieved September 10, 2016. ^ "Red Sox sign top draft choice Jacoby Ellsbury". MLB.com. July 13, 2005. Retrieved February 18, 2014. ^ a b "Jacoby Ellsbury Minor League Statistics & History – Baseball-Reference.com". Baseball-Reference.com. Retrieved April 14, 2015. ^ Callis, Jim. "Top Ten Prospects: Boston Red Sox". Baseball America. Retrieved January 6, 2006. ^ "WILMINGTON BLUE ROCKS TEAM HISTORY". milb.com. Retrieved December 3, 2013. ^ "News". seadogs.com. Retrieved July 12, 2006. ^ Beach, Jerry (March 19, 2007). "Diehard Prospect No. 2: Jacoby Ellsbury". scout.com. Retrieved December 3, 2013. ^ Haunss, Chip (October 27, 2006). "Ellsbury continues to thrive in AFL". mlb.com. Retrieved December 3, 2013. ^ Lindberg, Gary (February 21, 2007). "Big-league camp learning experience for Ellsbury". pamplinmediagroup. Retrieved December 3, 2013. ^ Callis, Jim. "Top Ten Prospects Boston Red Sox". Baseball America. Retrieved November 10, 2006. ^ Staff Report. "2007 Top 100 Prospects". BaseballAmerica.com. Retrieved February 28, 2007. ^ Smith, Bryan (January 19, 2007). "2007 Top prospects: Nos. 45–31". Sports Illustrated. Retrieved January 22, 2007. ^ "Jacoby Ellsbury Named Eastern League Player of the Month". OurSportsCentral. May 4, 2007. Retrieved December 3, 2013. ^ Manual, John. "Futures Update: Maybin Out, Ellsbury Back". Baseball America. Retrieved July 7, 2007. ^ Hickling, Dan. "Ellsbury sets hitting-streak record for PawSox". projo.com. Retrieved August 25, 2007. ^ "Red Sox announce winners of 2007 Minor League Awards" (Press release). redsox.com. September 26, 2007. Archived from the original on October 25, 2007. Retrieved February 4, 2019. ^ McPhillips, Alex. "Ellsbury gets called up to The Show". mlb.com. Retrieved June 30, 2007. ^ Malloy, Daniel (July 3, 2007). "Fast becoming a real favorite". Boston Globe. Retrieved July 3, 2007. ^ "The 'second coming' of Jacoby Ellsbury". Retrieved March 23, 2008. ^ "Press Release". redsox.com. Retrieved July 6, 2007. ^ Lefort, David (August 17, 2007). "Ellsbury in Game 2 lineup". Boston Globe. Retrieved August 17, 2007. ^ "Press Release". redsox.com. Retrieved August 18, 2007. ^ Edes, Gordon (September 2, 2007). "Team will be patient before scheduling date for encore". boston.com. Retrieved December 3, 2013. ^ "G137: Red Sox 3, Orioles 2". the joy of sox. September 2, 2007. Retrieved December 3, 2013. ^ Curry, Jack (September 15, 2007). "Attention Being Paid to Red Sox Rookie". New York Times. Retrieved September 15, 2007. ^ "Ellsbury, Loney named Rookies of the Month for September" (Press release). mlb.com. Retrieved October 1, 2007. ^ a b c d e f "Jacoby Ellsbury Statistics & History". Baseball Reference. ^ Brown, Garry (November 3, 2013). "Boston Red Sox rookies Dustin Pedroia, Jacoby Ellsbury set pace for 2007 World Series champions". Masslive.com. Retrieved December 3, 2013. ^ staff report. "Top 100 Prospects". Baseball America. Retrieved February 25, 2008. ^ Goldstein, Kevin. "Top 100 Prospects". Baseball Prospectus. Retrieved January 31, 2008. ^ Law, Keith. "Top 100 prospects of 2008". ESPN.com. Retrieved February 1, 2008. ^ "Opening Series 2008". Major League Baseball. Retrieved September 10, 2016. ^ "Pedroia's hit helps Red Sox top Angels". Salem News. Retrieved February 5, 2019. ^ "Brewers swipe Ellsbury's history attempt". redsox.com. Retrieved May 18, 2008. ^ Hurley, Michael (August 9, 2010). "Jacoby Ellsbury ties Jerry Remy's Red Sox record with four steals in one game". New England Sports Network. Retrieved October 9, 2014. ^ Petraglia, Mike (June 15, 2008). "Ellsbury sets club rookie steals record". mlb.com. ^ "Longoria, Soto are Rookies of the Year". mlb.com. Retrieved November 10, 2008. ^ "Ellsbury single makes playoff history". mlb.com. Retrieved October 6, 2008. ^ Curry, Jack (October 17, 2008). "Red Sox Stay With Crisp Over Ellsbury in Center". New York Times. Retrieved December 3, 2013. ^ "Sox In Focus: Jacoby Ellsbury". bostonsportsthenandnow. March 14, 2010. Retrieved December 4, 2013. ^ Cafardo, Nick (May 21, 2009). "The ultimate tracking device". Boston Globe. Retrieved May 21, 2009. ^ Browne, Ian. "E-8: Ellsbury makes first career error". MLB.com. Retrieved June 17, 2009. ^ Kennedy, Sean (August 14, 2009). "Hail to the Thief: Jacoby Ellsbury Ties Red Sox Record". bleacherreport. Retrieved December 4, 2013. ^ Browne, Ian (August 26, 2009). "Ellsbury steals way to club record". mlb.com. Retrieved December 4, 2013. ^ "Ellsbury wins Defensive Player of the Year". Boston Red Sox. Retrieved April 14, 2015. ^ "New York Yankees CF Jacoby Ellsbury will change jersey from No. 2 with Boston Red Sox to Roger Clemens' old No. 22". Retrieved September 10, 2016. ^ a b c MacMullan, Jackie (August 9, 2011). "Jacoby Ellsbury feeling no pain". ESPN. Retrieved December 4, 2013. ^ Abraham, Peter (July 26, 2010). "Ellsbury starts rehab assignment". The Boston Globe; Red Sox Blog. Boston, Massachusetts. Retrieved March 9, 2011. ^ Jeff Sullivan. "Jacoby Ellsbury Makes Third Trip To Disabled List With Rib Injury". SBNation.com. Vox Media. Retrieved April 14, 2015. ^ "Jacoby Ellsbury Officially Ruled Out for Rest of 2010 Season". NESN.com. Retrieved April 14, 2015. ^ "Red Sox center fielder Jacoby Ellsbury joins 30-30 club". Major League Baseball. Retrieved September 10, 2016. ^ "Jacoby Ellsbury Statistics and History | Baseball-Reference.com". Baseball-Reference.com. Retrieved September 10, 2016. ^ "Jacoby Ellsbury Named American League Comeback Player of the Year". October 13, 2011. Retrieved September 10, 2016. ^ "Cy Young winner Verlander also wins AL MVP". Retrieved September 10, 2016. ^ "Red Sox Transactions April 2012". Retrieved April 14, 2012. ^ Benjamin Klein. "Jacoby Ellsbury Breaks Boston Red Sox Single-Game Stolen Base Record". Bleacher Report. Retrieved April 14, 2015. ^ "Farrell: Jacoby Ellsbury should return". ESPN. September 8, 2013. Retrieved October 3, 2013. ^ "Red Sox notes: Jacoby Ellsbury returns, down time for Mike Napoli and Craig Breslow". Mass Live. September 25, 2013. Retrieved October 3, 2013. 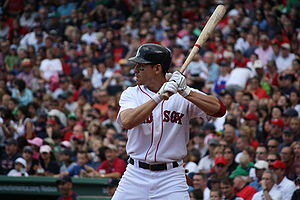 ^ "Jacoby Ellsbury: What Will the Boston Red Sox Do?". Archived from the original on November 11, 2013. Retrieved November 4, 2013. ^ "October 2013 - Boston Red Sox Blog - ESPN Boston". ESPN.com. Retrieved September 10, 2016. ^ Kransnick, Jerry (December 3, 2013). "Source: Jacoby Ellsbury, Yanks agree". ESPN. Retrieved December 3, 2013. ^ Nightengale, Bob (December 3, 2013). "Jacoby Ellsbury joins New York Yankees". USA Today. Retrieved December 3, 2013. ^ "Jacoby Ellsbury passes physical, seven-year, $153 million contract becomes official". December 7, 2013. Retrieved December 7, 2013. ^ "Yankees' Ellsbury booed in Fenway return". ESPN.com. Retrieved April 1, 2017. ^ a b "Jacoby Ellsbury Statistics and History". Baseball-Reference.com. Retrieved April 14, 2015. ^ "Jacoby Ellsbury » Statistics » Batting | FanGraphs Baseball". www.fangraphs.com. Retrieved April 1, 2017. ^ a b "Jacoby Ellsbury". ESPN.com. Retrieved April 1, 2017. ^ Matthews, Wallace (April 23, 2016). "Jacoby Ell-ectrifies Yankee Stadium with steal of home". ESPN. Retrieved April 23, 2016. ^ "Yankees' Jacoby Ellsbury steals home". Major League Baseball. Retrieved April 1, 2017. ^ "Yankees outfielder Jacoby Ellsbury set an extremely obscure record". For The Win. July 20, 2016. Retrieved July 4, 2017. ^ "The catcher's interference record is a symptom of Jacoby Ellsbury's problem at the plate - River Avenue Blues". River Avenue Blues. January 26, 2017. Retrieved July 4, 2017. ^ Hoch, Bryan. "Jacoby Ellsbury lands on DL after crashing into wall". MLB. Retrieved May 24, 2017. ^ "Yankees shut down Jacoby Ellsbury due to headaches". ESPN. Retrieved June 3, 2017. ^ "Yankees' Aaron Hicks: Will keep starting CF job over Ellsbury". CBSSports.com. Retrieved July 4, 2017. ^ Kreda, Allan (June 26, 2017). "Yankees' Jacoby Ellsbury, Back From Concussion, Swiftly Finds His Role". NY Times. Retrieved July 4, 2017. ^ III, George A. King (July 23, 2017). "Clint Frazier is making Yankees' $153M man disappear". New York Post. Retrieved July 30, 2017. ^ Hoch, Bryan (September 11, 2017). "We witnessed history at Citi Field tonight". Twitter. Retrieved September 11, 2017. ^ "Jacoby Ellsbury won't be ready for Opening Day". MLB. Retrieved March 19, 2018. ^ "Yankees shut down Jacoby Ellsbury with hip ailment". MLB. Retrieved April 3, 2018. ^ "Jacoby Ellsbury of New York Yankees has surgery, to miss rest of season". ESPN.com. August 7, 2018. Retrieved August 7, 2018. ^ "Jacoby Ellsbury begins 2019 on IL". CBS Sports. Retrieved March 28, 2019. ^ Swidey, Neil (March 26, 2008). "5 Things You Didn't Know About Jacoby Ellsbury". boston.com. Retrieved January 3, 2011. ^ Torre, Pablo S. (March 29, 2009). "How (and Why) Athletes Go Broke". Sports Illustrated. Retrieved January 3, 2011. ^ Benjamin, Amalie (February 22, 2009). "Asset freeze isn't that chilling for Ellsbury". The Boston Globe. Retrieved January 3, 2011. ^ Gayle Fee. "Ellsbury wedding has nice ring to it". bostonherald.com. Retrieved April 14, 2015. ^ "Jacoby Ellsbury & Josh Beckett Charity Wines Unveiled for Boston". Charity Hop Sports Marketing. Retrieved March 9, 2011. Wikimedia Commons has media related to Jacoby Ellsbury.